Having great devotion to St. Anthony to find things, Sister Mary Frances Lutty asked him to find the right Community for her. She looked in a St. Anthony Messenger and saw an ad for the Hospital Sisters of St. Francis which mentioned Perpetual Adoration and the care of the sick. Both appealed to her, so she wrote to the Community and went for a visit. The Sisters were very gracious and kind, and an atmosphere of peace and joy was evident. 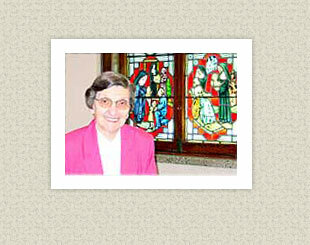 Three months later she Sister Mary Frances entered the Community. When Sister Mary Frances was in the seventh grade she thought about religious life and in fact her cousin, who was a year older, talked with her about it. Sister told her cousin to wait until she finished eighth grade and they could go together, but by the following year neither one of them thought any more about it. Many years later, although Sister Mary Frances did not think about religious life particularly, she did desire to draw closer to the Lord and she asked Him to guide her as to what He wanted her to do. While working at a Boy’s Catholic High School, a Marianist Brother asked her if she ever thought about being a Sister and that question prompted her to think more seriously about religious life. Sister Mary Frances was born on Troy Hill in Pittsburgh, PA on July 26, 1921. It was originally a German settlement and her family’s parish church, school, and St. Anthony’s Chapel were just a block from her home. After graduation she attended a girls’ Catholic High School which was close to the business section of Pittsburgh. It was there she met girls with varied ethnic backgrounds… a new experience for her. After high school Sister Mary Frances worked as a secretary for several employers and when she was 28 years old she entered the Hospital Sisters of the Third Order of St. Francis. The day after her first profession of vows she was assigned to St. John’s Hospital to work in the accounting office. She said that it would not have been her choice but she felt it was God’s will. Eventually, though she learned to like accounting. “Sister Mary Frances is one of the hardest working, no nonsense-minded and sincere person that I have worked with in my time with the Hospital Sisters,” Leo Lenn said. “She taught me much in learning the job of a Treasurer and I have always been indebted to her,” Leo added. “I likewise remember her loyalty to Sister M. Clarice Hoehn,” he said. As a part of her ministry in the Community, she served on the Microcom Team (a post Vatican II renewal effort), and visited all the American Provinces’ missions and branch houses. In 1982 Sister Mary Frances was elected as a General Councilor of the Generalate in Muenster and lived in Germany for six years. During this time she visited the Sisters in Germany, Poland, India, Japan, and Taiwan. There was also a visit to Korea as a site for a future mission that became a reality under the Japanese Province. Never did she think that she would have so many opportunities to travel. Now in her pre-retirement years Sister Mary Frances is privileged to spend more time with the Lord in the Motherhouse Adoration Chapel. She also continues her ministry of Franciscan hospitality in her daily activities at the Motherhouse. She is an inspiration to many and a testament to listening to God’s call and a devotion to St. Anthony.